Juri wrote: the Match in a game Go between the best human Lee Sedol and Google-programme AlphaGo provoke a very big interest in the World. Artificial intelligence is wiining 2-0 for the moment. Now it is clear: human can not beat computer, but able to draw. is it possible for Human to draw the Match against the best Programme? Just speculating, of course, but I think that if Google would spend the same resources on draughts as they have on Go (1200 computers currently playing against Lee Sedol, a full year research by a dedicated team using most sophisticated deep learning algorithms), then no GM would be able to draw against such a program. For the existing draughts programs made by individuals (Scan, Kingsrow, Dragon), I think it's possible that a GM might be able to draw in short killer-draughts matches, but not in long matches. 90% of participants of the Heerhugowaard masters dont want to play Killer! Some of them even don't know clearly rules of Killer-draughts, confuse it with Thai-draughts. just now finished World Cup in Suriname. how many dificult end-games with we had which can be lost in killer? 1-2? my game with Schwartsman. we agreed for draw. In killer - not clear. agreed for a draw, but in Hard-killer - how to draw? Heerhugoward is not Worldcup, it is an commercial tournament. I ran my Killer draughts program against itself. In the first game, white wins a 2 against 1 Dame endgame (chess notation) /Mats. Look like it is time to recall Killer-draughts againe! Resulting games aim to zero! Despite the fact that in tournament are playing players from Asia, America and Africa, who are very far from the firts top-10 of raiting! Killer-draughts is changing end-games. How many end-games we have? As for me, more interesting to follow Frisian-draughts games - there you can not predict the result. Super-blits it is not a solution at all. 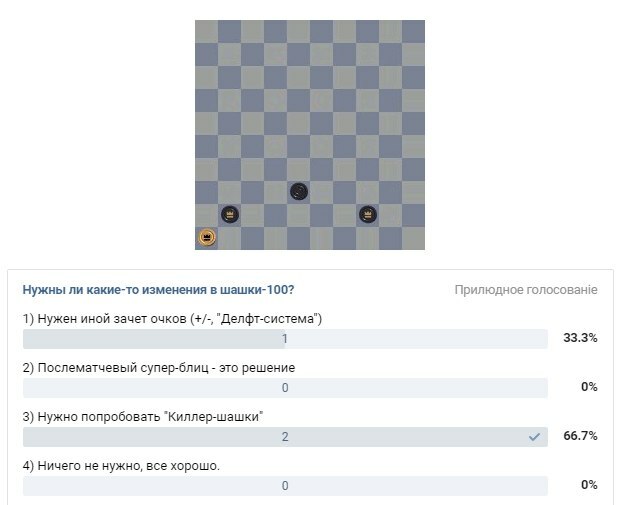 Due to very law resulting in the World Cup in Ufa with the classical time control again raise the question of "Killer-draughts". In fact there are 3 variants. 1) Giving a draw with the advantage (3 to 1, and so on) more points. Like the system in Delft and "+/-". Someting as in other sports. It seems that nobody in a knockout, but someone still won. A demerit - you have to suffer in a drawn endgames, in a ranking there is no clear winner. 2) Solve result in a super-blitz (as in Ufa). In essence, it's like after every match to use an 11-meteres penalty. 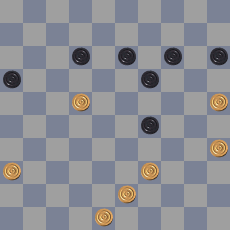 Advantage - all rules of the normal draughts-game are saved. Disadvantage - penalty becomes very important, which are very similar to a lottery. And also there is no clear winner, have only a winner in penalties. 3) Killer-draughts. There are two types: hard and light. Hard - 2 to 1 win, light - actually 3 in 1 (light version is very close to + \ -, and Delft-system). Advantage - in one game have a definite winner, efficiency will be high. There are only 3 results. The disadvantage - we get a slightly different game. In fact, there will be no usual endgames. In light version just a little have, endgames similar to 64 draughts. But the middlegame and a combination part - all are left. Just for example, in position 3 by 3 will be not a draw. Juri wrote: 90% of participants of the Heerhugowaard masters dont want to play Killer! With white to move this is a draw after 1.36-31 15-20 2.43-38 20-24 3.38-32 13-18 4.22x13 19x8. Black to move wins after 12-18 2.22-17 18-22! 3.17x28 29-33 4.39-34 33x22. This position is lost for white. White to move: 1.39-34 13-18 2.44-39 18-22 3.26-21 17x26 4.16-11 26-31 5.11-6 31-36 6.6-1 12-17 B+ Black to move: 13-19 2.39-34 12-18 3.26-21 17x26 4.16-11 26-31 5.11-7 31-36 6.7-1 28-33 7.1x14 33x42 B+. In both cases I think the result with killer draughts is completely reasonable. I'm using a prerelease version of Scan 3.0 by Fabien Letouzey that can play with the killer rules. Based on my experiences so far I can tell that the killer rules solve the drawing problem in a very natural way. Many people refuse to consider the number of draws between grandmasters a problem. But take a look at the Turkish open in Izmir that is being played right now. After 8 rounds the fourteen 2300+ players together have lost only 1 game! The World cup final in Ufa had exactly the same scenario. Wieger Wesselink wrote: I'm using a prerelease version of Scan 3.0 by Fabien Letouzey that can play with the killer rules. Based on my experiences so far I can tell that the killer rules solve the drawing problem in a very natural way. Many people refuse to consider the number of draws between grandmasters a problem. But take a look at the Turkish open in Izmir that is being played right now. After 8 rounds the fourteen 2300+ players together have lost only 1 game! The World cup final in Ufa had exactly the same scenario. I agree with you that the number of draws between grandmasters is a problem. And it's not a new problem. Not only do we see this in the world cups, but also in the world championship tournaments of at least the last 20 years. So something has to be done and killer draughts is in my opinion a possible solution. Just start to experiment with it at some high level tournaments (for example world cups). I remain unconvinced that switching to Killer will result in less draws. Yes, if the game is played in the same way as it is now, it'll probably result in more wins, but very soon, grandmasters will adapt to the new dynamics, change their way of playing, and even then there is a significant drawing margin. The only thing that will save the game is a change in mindset. Currently, not losing is more important than winning. If both players are intent on not losing, the game is a draw even before one move is played. ildjarn wrote: I remain unconvinced that switching to Killer will result in less draws. Yes, if the game is played in the same way as it is now, it'll probably result in more wins, but very soon, grandmasters will adapt to the new dynamics, change their way of playing, and even then there is a significant drawing margin. In a previous thread (viewtopic.php?f=65&t=2599 ) I analyzed dozens of balanced 3x3 and 4x4 endgames (balanced in the sense that there each side had its pieces on its own half of the board, and the positions were database draws). My conclusion then was that Killer draughts would cut the draw percentage in half (to 40-50%). Maybe that adjustments in playing style would raise it a little, but my guess it would be comparable to chess. I can't understand your reasoning at all. If the drawing margin is lowered substantially (from 4 against 1 towards 2 against 1) this will most certainly affect the number of draws. You seem to suggest that the high number of draws is only caused by the players and not by the rules of the game. Even if this were true for regular draughts (I don't think so), a strategy of playing for a draw is very dangerous in Killer. Suppose someone is playing for simplification and exchanges into late middle game positions. At some point, even the tiniest of disadvantages (a couple of tempi less, opposition against, a slight imbalance in piece distribution) can lead to a loss. 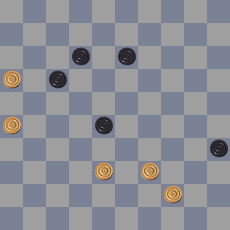 The 4x4 positions I analyzed were all a draw in regular draughts, and half of them would have been a win in Killer. And there are no doubt many more positions that simply don't appear in TurboDambase because they were agreed draws a lot earlier (e.g. at the 7x7 stage already). In Killer, this would not happen anymore. I am the author of Scan. It is not famous but very strong nonetheless. This is my first time posting outside the computer section. Wieger Wesselink wrote: I can't understand your reasoning at all. If the drawing margin is lowered substantially (from 4 against 1 towards 2 against 1) this will most certainly affect the number of draws. You seem to suggest that the high number of draws is only caused by the players and not by the rules of the game. I think I understand ildjarn. Imagine that instead of saying "the proportion of draws is divided by 2", I claim: "the proportion of non-draws is multiplied by 5" (random number). So 90% draws would go down to 50, but 98% would still leave 90 in Killer draughts. I don't agree with the mindset theory, however. Programs don't play for a draw (they are risk-neutral) and have a huge draw rate anyway. We have the same problem in the chess community. The conservatism is overwhelming. Everything must remain as before. The other way to counter the draw problem is simply to increase the board size, I suppose. It seems that 20 pieces each on 50 squares (as only half the board is used) creates insufficient complexity for grandmasters. Comparatively, Turkish checkers is played on an 8x8 board. But since all 64 squares are used, the board is bigger than in International Draughts. In Turkish checkers, 3 versus 1 King is won. Look at the topmost game at below link. The winning combination is astounding.